Atlanta Braves catcher Brian McCann will be continuing rehab with the Gwinnett Braves at Coolray Field before returning to the parent club. McCann has already started the season with the Rome Braves since his off-season shoulder surgery. He began his rehab assignment on April 26, playing three games with the Rome Braves testing his “new arm” while going 3-for-11 with a double, two home runs, three runs scored and five RBIs at the plate. 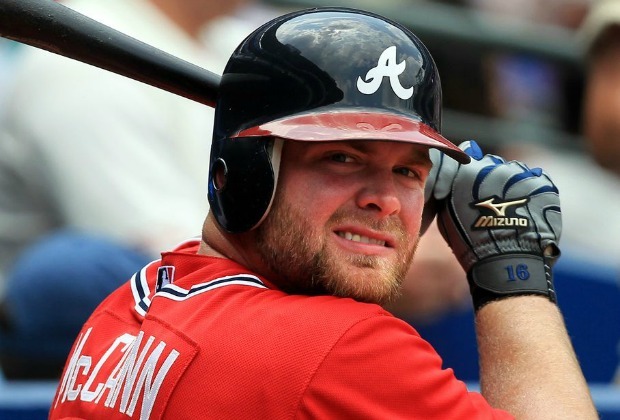 McCann had an average season with Atlanta last year by his standards before his injury that occurred on Oct.16, 2012. He hit .230 in 121 games for the parent club, a number that pales in comparison to his .279 career batting average in 11 years with the Braves. This marks McCann’s third rehabilitation stint with the Braves’ affiliate in Gwinnett. McCann played in one game in 2009 and two games in 2011. He tabulated a .333 average in nine plate appearances in Gwinnett. Atlanta regulars hortstop Paul Janish (left shoulder surgery) and first baseman Freddie Freeman (strained right oblique) have been in Gwinnett this year as well. McCann’s next assignment before heading back to Turner Field will be with the G-Braves tonight and tomorrow. There is no allotted time frame for total recovery from this surgery, he is expected to be with Atlanta by next week. The G-Braves will host the next three games and will keep a close eye on the rehabbing catcher. Atlanta is anticipating to see McCann in the Turner Field dugout for next week’s series in Cincinnati.